in continued development of new and existing technologies in Jamaica. A big welcome to Gabrielle Higgins, our latest volunteer! My name is Gabrielle Higgins. 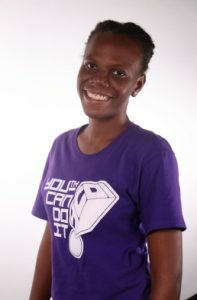 I am a second year student at UWI, Mona pursuing a BSc in Computer Science. Originally my plan had been to major in Biochemistry and minor in either Computer Science, but the more I practiced programming the more I fell in love with it. Last semester I was very conflicted about whether I would drop Biochemistry or not because doing two programs did not give me enough flexibility to learn as much as I would like to. In the end I chose Computer Science over Biochemistry and I don’t regret doing that. I really appreciate organizations like The Palisadoes Foundation because they drive the development of the country. Palisadoes has done very well in providing opportunities to university students. It serves as a source of inspiration even to students who do not apply or get through. The message is simple but powerful. “Open source software is essential.” To go through such lengths to encourage students to develop open source software communicates how important the Foundation believes it to be. I strongly agree with them. No doubt, every software developer has used open source software at some point in their journey. Looking forward, I’m excited to be a part of the team that helps to build a Caribbean presence in the Open Source community. We’ll keep you all posted about her activities and more. Calico Volunteer Silicon Valley "Selfie Tour"
http://www.palisadoes.org/wp-content/uploads/2017/03/palisadoes-logo-340x156-jao.png 0 0 Press Office http://www.palisadoes.org/wp-content/uploads/2017/03/palisadoes-logo-340x156-jao.png Press Office2018-07-25 05:26:032018-08-21 05:33:43Calico Volunteer Silicon Valley "Selfie Tour"